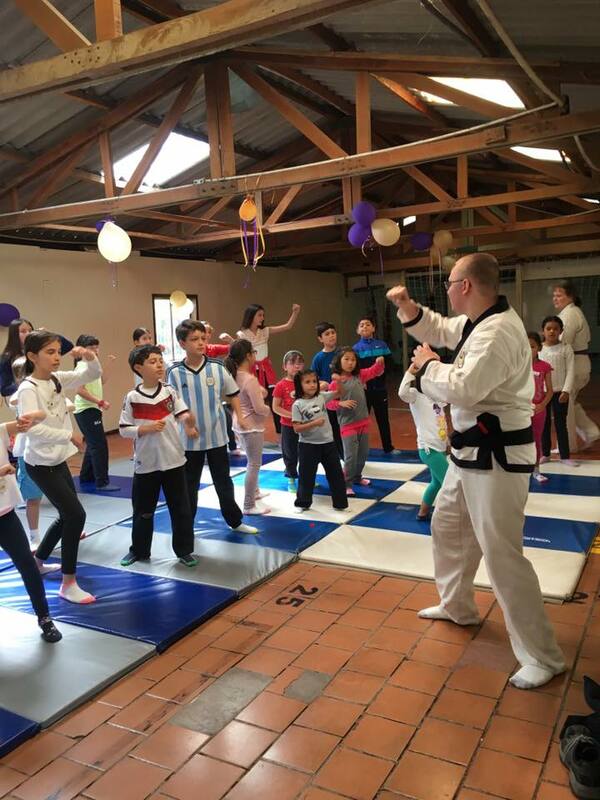 Christian Martial Arts is about serving people in the name of Jesus Christ. That is the great example, legacy and commandment Jesus gave us. There are many ways to “serve” and teaching people how to defend themselves against personal and spiritual attacks is a great way to do that. The Edgar family has been an important part of Grace Martial Arts since 2004. Sarah, Nathan, Joshua and Jonathan are leaders, teachers, students and great friends. When I moved from Tampa to Alabama three years ago, the Edgar’s stepped up with many others to keep our classes moving forward. We had a good time during our Tampa classes adding sign language to our Scripture memory times and that has blossomed into a wonderful ministry to deaf people in the South American country of Columbia. I asked Nathan to share with us some of his thoughts about their recent mission trip. “Thinking back on the missions trip, the most valuable lesson I learned was the importance of placing your focus on what God is accomplishing through you, even if His work isn’t immediately evident. The first Sunday we were in Colombia, we taught self-defense to a group of deaf people for a couple hours while presenting the Gospel. The entire night went so smoothly; people were attentive to both the self-defense instruction and the Scripture. They were engaging with us and getting excited about practicing the lesson in the coming weeks, and I felt that my presentation of the Gospel really communicated my belief and passion for Christ. The next Sunday, we served another group of deaf people that had some slightly different members. The night felt totally different. While people were attentive, they weren’t engaging or practicing the techniques themselves. I felt that my delivery of Scripture while teaching didn’t flow well with the self-defense concepts, which differed from last week where I felt that the teaching and Scripture flowed smoothly together. At the end of the night, I felt that my Gospel presentation sounded stiff and awkward. And when I looked back on both nights that second Sunday, I jumped to the obvious conclusion from those descriptions: the first night was a success, and the second was a failure. I felt like the second Sunday was almost a waste. I wondered what it might have been like if I was less tired, or more impassioned in my delivery, or if the schedule was better planned out. But when I took a couple minutes to really examine what happened, I realized that despite how different they appeared, both nights were a resounding success. The evidence lay in something missing from my descriptions above: What was going on in my heart and the hearts of those I was working with? I knew that we were committed to serving the Lord that night. Through our acts of love and our delivery of Scripture, we were presenting the Gospel honestly and genuinely. Our focus wasn’t on making ourselves look better or on feeling good because we did the right thing; it was on serving God. Looking back, I realized that was all God asks and expects of us. It’s easy to fall into the trap of taking responsibility for everything going on. We want to be praised when we serve others and it leads them to a profession of faith, and if people don’t seem to be receptive, we feel like it’s because we didn’t do a good enough job. And that sounds right, doesn’t it? If people didn’t listen, we need to do a better job. But really, that attitude is very prideful, and it ignores what God teaches about evangelism. When we take full responsibility for everything that results, we paint ourselves as the teacher, the prophet, and the evangelist. In truth, God is all those things. He opens the hearts of the people to His Word; He preaches truth through our mouths; and He serves them by filling us with such love that we overflow and show that love to others. God is the author and perfecter of faith, not us. We are tools and vessels for Him, and to try to say that we are responsible for the change that happens in a person’s heart to draw them to God is a great overreach. And I count this as a great blessing. I know I am a deeply flawed creature. God has much work to do in me yet, and even in my best moments in this life I will still fail to be a perfect reflection of Him. So, why would I take it upon myself to be responsible for people’s reactions to my presentation of the Word? There is such comfort in recognizing that it is God’s work that brings someone to Him. We have a vital part to play in evangelizing, and that part is to serve as God’s vessel. So long as we speak the Word truthfully, and show God’s love genuinely, and so long as we do it to His glory rather than our own, we have done well. Everything that comes after is in God’s perfect hands.